The idea of capitalism as an economic system became known in the Western world after the end of feudalism. 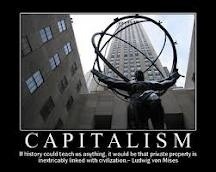 Capitalism is notable for its elements of private ownership of the means of production, the creation of goods and services for income, and the accumulation of wealth. Capitalism is viewed as encouraging economic growth and giving all people the ability to reach any level of economic development, as measured by Gross Domestic Product (GDP). In the 21st Century, the United States is one of the most notable and recognized capitalist economy. The U.S. is a model for most nations as what a capitalist system should be but, in the past few years, economists are beginning to wonder if letting a free market control production, price, and allocate resources is a good idea despite the increase in global GDP. With the U.S. and world economy in trouble, the high rate of unemployment from 2008 until recent and the gradual disappearance of the middle class, the question is whether or not the capitalist system is doing exactly what it is meant to do. The idea here is to put capitalism on trial and let you the reader be the judge to decide whether capitalism as an economic model has failed or if the failure lies in the way it is implemented by the government. Those who believe in wealth creation and the capitalist system, have claimed that capitalism as a model can promote economic growth. They borrowed their ideas from Adam Smith’s advocacy that by letting free markets control the means of production and allocation of resources, is a better way to increase individual ability to reach the highest level of both economic and social status. Proponents of the capitalist system claimed that by increasing the GDP will bring about improved standards of living including better housing, food, health care, clothing, and other necessities of life. They are of the view that the availability of a better way of life means less hours of work per week and decreased participation of children and the elderly in the workforce. They claim capitalism has the potential to help the individual raise his income through professions and business ventures possible in a capitalist economy but lacking in the feudal or the socialist societies. Looking at the current state of world economy and today’s state of the U.S. economy, is it wise to say that capitalism has fulfilled all the above as claimed by the proponents and supporters of the idea? If not, what will it take for the capitalist model to function optimally? Note that the economies of the United States and Western nations of Europe as of this day have failed to support the success promised by the capitalist system. The U.S. is currently about 18.96 trillion dollars in debt and some nations of Europe are at a near economic collapse. Many income earners in the United States are forced to take lower wages since the beginning of the crisis and unemployment is at a record high level never seen since the great depression. The confidence in the government to turn around the economy is at the lowest ever and now we are beginning to experience in America the emergence of a new group of the extremely poor, the mid poor, and the near poor Americans. The middle class that is a pride of America is gradually disappearing and going down the economic ladder. College graduates are roaming the streets without job and deeper in debt but yet, a small group known as the 1% continues to accumulate wealth while the so-called 99% are becoming poorer, losing their homes to foreclosure, and unable to realize the promise of capitalism. While we love the idea of freedom and a free market economy, the current state of the economy will bear witness to the fact that something is wrong with the system. Many have argued there is nothing wrong with the capitalist model but rather, the problem is the way it is implemented by the government and political apparatus. This is making some to think whether the system could have worked better with a political system that allows for free market but at the same time put in place proper and effective regulations controlling the flow of commerce and the allocation of goods and services. Many encouraged by the Marxist ideology, have advocated a revolutionary overthrow of capitalism that will lead to its replacement with socialism. They criticize the system for its creation of social inequality and unfair distribution of wealth, power, and the economic means of production that allows a few to accumulate wealth at the expense of the populace. Capitalism they claim is a medium to a market monopoly, a rule by oligarchs and a means to both economic and cultural exploitation leading to the repression of workers, labor unions, unemployment and economic instability. Whatever the case, it is without doubt there are some faults in the system. For capitalism to work effectively in the United States there are steps the government must take or else, it may be difficult to reverse the current economic bubble destroying American middle class and driving many into poverty. First, the U.S. government need invest in human capital and education not just consumption. Education is no longer affordable in the U.S. and those who dare go to college must take huge loans with variable interests to fund their education. Rather than make education affordable, the government is spending more on consumer goods which most of the times are made in China and other places outside the U.S. By failing to invest in human capital, there is a decrease in production capability killing American jobs and causing high unemployment. There is a need to fix American tax code; businesses are paying too much tax on payroll and as a result unable to hire. There are not enough incentives for companies to hire and the higher income taxes are taking American jobs overseas. The tax system is not progressive enough; the rich still pay less than the poor which so far is generating debates in Congress over the Bush Tax Cut. Some rich Americans such as Warren Buffet have asked that the rich be asked to pay their fair share but some in Congress want it the way it is. Also, the double standard treatment of the financial institutions is incapacitating the capitalist system. There are no proper regulations of the banks in place; banks make whatever profits at the expense of the vulnerable. They give out loans with huge interests in the name of profits making and when they fail, they are bailed out by the government while the poor are left to forfeit their homes to foreclosure. Lobbyists in Congress use their power to protect failing banks while their customers pay the price. The current economic optimism is not justified; records will show unemployment is still high and that current improvement is not sustainable however, we are made to believe the economy is recovering. Most jobs created are seasonal and of low-income, it is time the government become transparent on the true state of the economy for the system to work. The forecast for growth is low in a country where you are taxed for investing in the future. Capital gains are taxed and you must pay tax on virtually every consumer goods you purchase whether clothing or food items. Irrespective of whether or not the government needs tax money for social services, taxing consumers for personal goods after same people have paid income taxes, is double jeopardy and a testament to why capitalism is failing. Besides the regulation of financial institutions, there should be a credit card reform. Many are deeper in debt and unable to climb the economic ladder due to ineffective credit card regulations; the issuer is able to charge unreasonable fees and even when there is a regulation in place, the issuer finds a way to beat it but yet, the consumer is left with the consequences. There are various views about the capitalist system, while some support the ideology, there are those who believe the system is irrational because the production and the direction of the economy are usually unplanned leading to inconsistencies and internal contradictions. 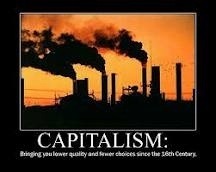 After all, capitalism may not be the problem but the way it is implemented. You are to judge.